A stroll through your local farmers market may reveal all sorts of unusual and funky looking foods. There is no better time than now to sample all that nature has on offer! Channel that adventurous spirit of yours and stock up on these flavourful, nutritious and not-so-mainstream fruits and vegetables. Read on as we help the produce-curious by giving you hints on taste, nutrition and preparation to fuel that creative spirit! Kohlrabi. Member of the Brassica family, just like broccoli, cauliflower and Brussels sprouts. It has a mild, sweet flavour that is a cross between water chestnut and turnip. 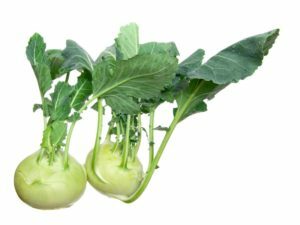 Kohlrabi is a good source of fiber, vitamin C, potassium and anti-inflammatory phytochemicals, including cancer-fighting isothiocyanates. [iv] It is also extremely low in calories yet filling, making it a beneficial addition to a weight-conscious lifestyle. Zucchini Flowers. These beautiful, edible flowers are too delicate to survive the harsh grocery store environment, but if you look closely, you’ll notice them at many a farmers market. Zucchini flowers are slightly sweeter and have a more subtle taste than zucchinis. They contain water and a range of minerals, including a healthy dose of potassium, making them a tasty way to replenish after a sweaty day in the sun. Although they are typically fried, we recommend either baking them or eating them fresh (since deep frying is never a healthy choice). Try consuming zucchini flowers fresh on salads, or as a soup garnish, or drizzle them with truffled vinaigrette and herb aioli. You can also stuff them with ricotta cheese and bake them at 200 degrees celsius for 20 minutes, or quickly sauté them and serve them as a side dish. Try popping them on their own if they are well ripened (look for a purple tinge) or added to a fruit salad. If they are picked in the early stages and still green, they will be quite sour and better for cooking. You can boil both the green and the purplish berries and consume the liquid as a tea or you can add a scoopful to water and let it infuse for a sweet-tart alternative to lemonade. You can also make jam out of sweet gooseberries or use the sour ones to make relish.